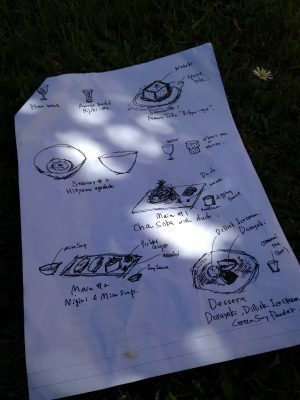 At 7pm on the seventh day of the seventh month, Cork-based Japanese chef Takashi Miyazaki cooked a meal to celebrate the festival of Tanabata. A star festival that’s based on the myth of two star crossed lovers, the twist was that he did it underground in the atmospheric setting of the Mitchelstown Caves. The Tanabata dinner, which was part of the 2016 Clonmel Junction Festival, sold out – unsurprisingly – as soon as it was announced. I didn’t make it to the meal but I did take my smallies along to enjoy another (slightly!) food-related Junction Festival event; the Sugar Plum Fairy Trail at Con Trass’ Apple Farm was an unalloyed success, the girls barely able to contain their excitement at discovering such a wonderland amongst the aged and gnarled plum trees. We packed a picnic to eat by the swings in the sunshine, bought just-picked strawberries, clanking boxes of apple juice, cider and vinegar and narrowly missed out on the start of the year’s cherries. An almost totally successful day out, all round! That was just for sunshiny July but fortunately Takashi Miyazaki is for all year round. You’ll find his teeny little restaurant / takeaway on Evergreen Street in Cork. Make sure you snaffle one of the six high stools to sit in the window and slurp lemon ramen, a most comforting bowlful of happiness and health. If I could give you another suggestion, it is to also order one of the takeaway dishes and bring it home with you. That way you’ll have two nights’ worth of Miyazaki for the price of one visit. Believe me, you’ll be glad you did. Find Miyazaki Cork on Instagram.